- Capture all the tiny and wide scenry of whole world in your cell phone. Widely use to most Smartphone such as iPhone X 8/8 plus, 7 / 7 plus / 6s / 6 plus / 6s plus / 5 / 5s / SE, Samsung, iPad, etc. For double back cameras lens and large lens, such as iphone 7 plus and Samsung galaxy S7 Edge, it may not work well with our phone camera lens, it will cover the flash lamp, and have black border around the edges. ★ 0.45X super wide angle lens for a high definition wide angle image without distortion. ★ Use the Wide angle: Leave the two lens Screwed. ★ Separate the two lens by Unscrewing to Remove the Wide Angle Lens. Note:When using these iphone lens, you had better Take your Phone Case Off for a better shooting effect. 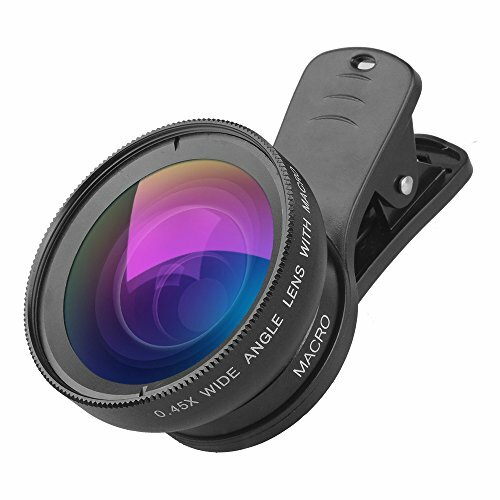 2 In 1 HD Camera Lens Detachable: Clip-On Professional HD Lens With 0.45X Super Wide Angle Lens + 12.5X Macro Lens For Mobile Phones , Digital Cameras. This Perfect Cell Phone Lens Is Suitable For Photographers, Travel Lovers, It Takes You To Capture All The Tine And Wide Scenery ( Travel Scenery, Wide Landscapes ) Of Whole World In Your Cell Phone. If you have any questions about this product by Apexel, contact us by completing and submitting the form below. If you are looking for a specif part number, please include it with your message.